Several years ago I used to work for Simple Scrapbooks (so sad that they are no longer). I traveled the convention circuit and taught classes for them and the idea for today's project came from one of those classes. The actual class was developed by Wendy Smedley and I loved the finished class project so much that I've re-used the idea several times. It's such a simple project and it can be adapted or redone for different holidays, seasons or events. Plus, it's a good way to use up all those little loose ends of ribbon and fibers. 1- Gather your supplies. You will need various ribbons, a frame, a mat or chipboard (think cereal box) to make your own, tape, and scissors. 2- If you have a mat you can skip this step and move on to step three. If you don't have a mat, you'll need to make one. I simply cut the outer dimension first, for me this was 8.5x11 as I was using a document frame from the $1 store. Then I cut the center part out. Remember when you are making a mat that you want to leave the bottom area with slightly more than the top. It looks better that way. 3- Start wrapping your ribbon around the mat. It doesn't really matter where you start but I usually start on the sides. To secure it in place you will need to tape it to the back of the mat. 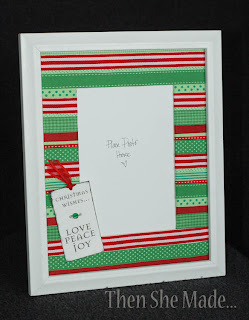 You can use any tape or even hot glue, I just prefer painters tape because if I want to redo my frame for a different holiday, painters tape has a low tack and comes off easy - that's just a personal choice, though. Use what you like. 5- Now you just need to add a photo and place it in a frame and you're done! Easy, right?! I love easy. Plus, this is another project that is really easy for kiddos to help with or even make on their own - gotta love that. Also, here's one I did for Christmas from a few years back - Enjoy! Great way to use up odd bits of ribbon...love the added tag on your Christmas version! That's beautiful. I really adore the Christmas frame. I'm a sucker for Christmas. Awesome! looks great I love all that ribbon. So, so cute and inspired! I love it. What a wonderful X-mas gift that would make!